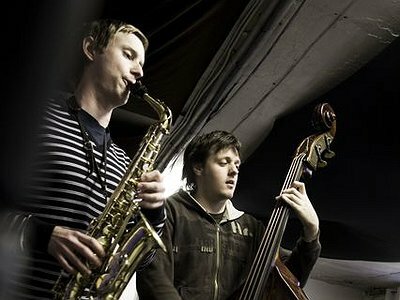 Having played with many contemporaries and even some his idols, the Norwegian saxophonist Klaus Ellerhusen Holm can safely be named amongst the best and brightest in the field of free jazz. Having studied jazz and composition at Trondheim music conservatory, Holm has played and continues to support the Trondheim jazz orchestra, but is perhaps most well known for his involvement with Ballrogg. Having released two albums as a duo with bassist Roger Arntzen, Holm now also plays with guitarist Ivar Grydeland. Exploring jazz in the style of Eric Dolphy, Morton Feldman and Bill Frisell, Ballrogg's latest album has been described as cinematic, transcendent and inventive, embracing both a European and American aesthetic. Like many Norwegians I started playing in a school band. I started on the cornet at the age of 6 or 7 I think. Since I didn’t do well on the cornet, the next year I got to change to saxophone, which I originally wanted and have been playing ever since. Like many other Norwegian saxophone players, Jan Garbarek was an early influence. At 8 years old I was mostly fascinated with the massive sound he could create with his instrument. After that I discovered the American quartet of Keith Jarret and then Eric Dolphy. In many ways Eric Dolphy is the only one of these early influences I still relate to the most. When I auditioned as a musician for a dance piece and said I could play three instruments I didn't have a clue how to play. I was broke and needed the money. I figured I could learn and there was still three weeks before they started rehearsing. Keith Rowe once asserted that it is often certain people that “give one permission to do things”. How was that for you – in which way did the work of particular artists before you “allow” you to take decisions which were vital for your creative development? When a friend of mine tipped me off about a duo from Berlin called “The international nothing” that really put me on a different track musically and had a big impact on many of the projects I was involved in at the time. I have always been fascinated with overtones and micro tonality, but this duo had systemised everything and it seemed so logical. That opened up a series of new musical possibilities for me. I work with a number of different projects ranging from things in the free jazz realm, to improvised music and semi-composed forms. Lately I have just finished a self-imposed period of 5 months without playing concerts. I'm trying to figure out what I get the most out of, of all the things that I’m doing. What I should continue working with and what not to. The process has been positive, and I think it’s a good thing to take this kind of time out once in a while to reflect on what you are doing. Hopefully improvisation and composition are two sides of the same thing if you master it well. The first time I heard one of Scelsi's solo pieces for clarinet I thought it was improvisation, but it’s actually composition. I’m full of admiration for composers that can take very little material and stretch it out to a great 20 min piece. Norwegian composers Jon Øyvind Ness and Ole Henrik Moe are two composers that also fit into this category, which I really admire. How important are practising and instrumental technique for achieving your musical goals? Most of the music I play has its roots in the acoustic sound of the instrument, and since saxophone and clarinet are wind instruments it will not sound that good if you don’t keep up a minimum of practising. That being said, I really enjoy developing new techniques and practising. But it’s equally important to get new inspiration and listen to new music that inspires, and to have a clear idea of what you want to do. Sometimes I think finding new inspiration and discovering new music can be much more demanding and difficult than the practising. Exactly how the space defines the sound in the room and how that affects the performance is hard to say, other than it has to be mainly psychological. Over the last years I have been working a lot with multiphonics and linking this material to different pitches. This can create really nice overtone effects, and I have found this material to be very useful in a broad range of musical settings. When I played in the school band my only goal was to play louder than anybody else. I think I succeeded with this for a short time until my teacher asked if I was trying to take over the entire band. He couldn't hear anybody else over my playing, so I learned my lesson early. I also actually have a great book by John Stevens about teaching music in a group that is really excellent. It has a number of exercises that makes the musicians listen more to each other and makes them be aware of the sound in the room. I haven’t done a lot of solo concerts, but the times that I have, a good thing is that it makes you really get down to the essence of what you are doing and helps you decide what material gives you the most inspiration. Finding new inspiration and discovering new music can be much more demanding and difficult than the practising.